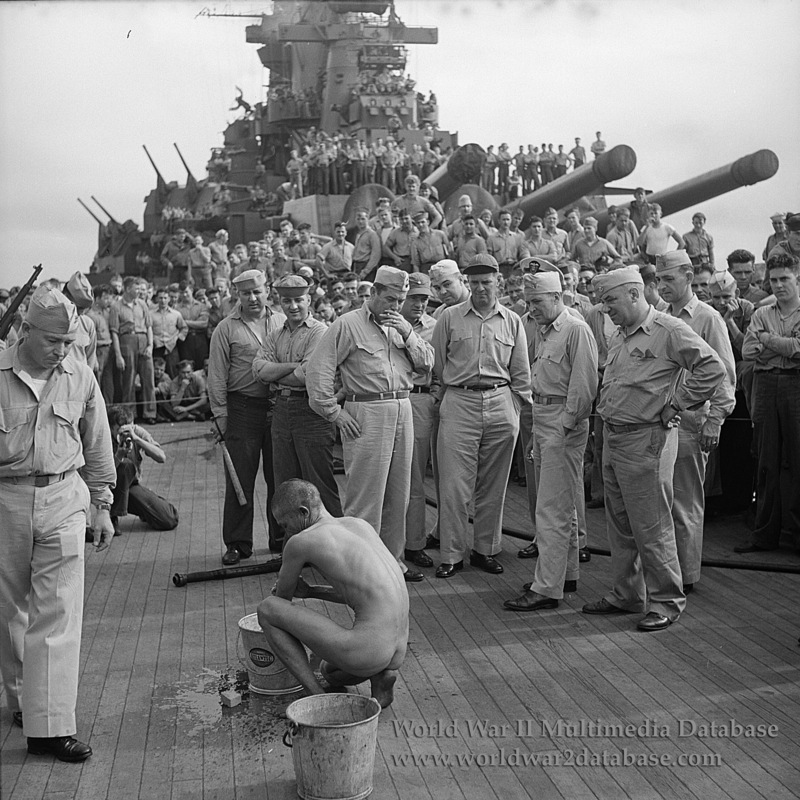 Crew of USS New Jersey (BB-62) watch as a Japanese prisoner of war is shaved, deloused and bathes himself. Likely he was part of an air attack against 3rd Fleet while the US Navy was making strikes on Luzon. At this time in the war, the Japanese most Americans encountered were already dead. A live prisoner was a source of great interest; the entire crew would turn out to see the hated enemy. Since the Japanese encountered in the Philippines were often cut off from resupply, short on food, unable to control camp vermin and lacked enough fresh water. It was standard procedure to throw overboard or burn their clothes and issue American uniforms. If the Japanese did not resist while being captured, or was injured, they were likely to receive medical attention and a higher standard of rations than they were receiving from their own unit. If they resisted capture, or the Americans were unable or unwilling to take prisoners, they could be killed instead of captured. Date estimated.